The people of the Kangra district of Himachal Pradesh have always shared a deep connection with their water system. After all, it is here that people live right below the stunning Dhauladhar range, from the glaciers of which they get their waters. The glaciers flow down in streams or khuds from where water is diverted towards habitation and agricultural lands in a complex web of human dugout kuhl canals. For generations, until the early 90s, this system of gravity flow kuhls were completely community-managed. 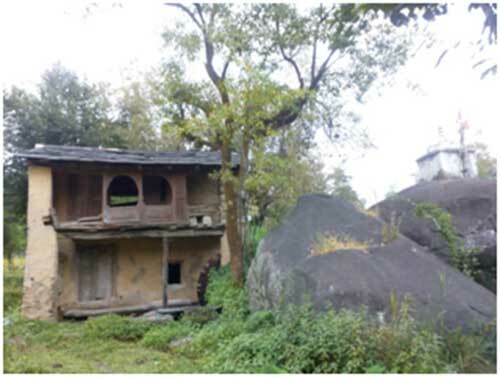 Although, this article focuses more on the Kangra region, this system of kuhls exists in many parts of Himachal Pradesh, where people depend on gravity flowing water canals for household use and irrigation. Before liberalization of the Indian economy, the water system was managed as a commons by a local and community- led team of authorities. Some of these authorities were traditional in nature,which also meant that they were upper caste,and they passed down the authority and knowledge to their succesors in an oral form. The British documented and wrote about these customs, in a document called Riwaj I Abpashi, which reduced the reality of kuhl management into a scientific text yet preserved a lot of historic information for time eternal. At a super-natural level, people believed that the water canals had a kuhl devi, who even in times of drought, when the people took good care of the waters and sacrificed a black goat, would reciprocate with bountiful supply. The kohli was the authority of the kuhl, who performed sacrifices and prayers towards the kuhl devi, and also had deep knowledge of how to manage their own water system. The kohli would also perform a prayer to Quaja Pir, a sufi sounding God showing the syncretism that existed in this valley, to prevent situations of floods. On several occasions, particularly around the sowing of rabi and kharif crop, the kohli would summon the community, and bands of 60-80 men would gather to work on the kuhls. In addition, the heavy flowing waters worked the gharaat or water-mills, managed by the village gharati. “ Flour ground in the gharaat tastes sweet and not burnt unlike the flour in the electric mill,” says Sachin, a villager of Rakkar. In the past, all of these authorities, the kuhl devi, Quaja Pir kohli and gharati garnered alot of respect and were thanked in the form of grain. Post-liberalization, however, due to various factors but the strongest one being non-farm jobs, their management transformed from community worked water systems to kuhl committee run systems. A kuhl committee is a group of elected village members who would take charge of running the kuhls, often collecting small funds from the villagers in exchange for carrying out the work. 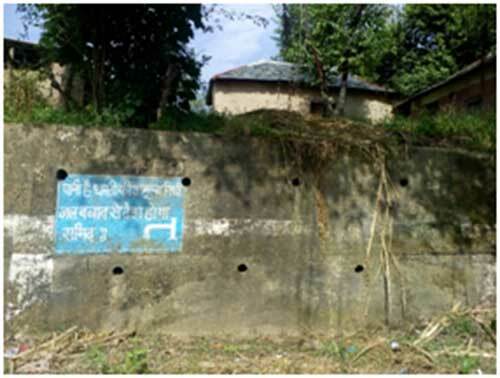 Further still, other villagers allowed the government IPH(Irrigation and Public Health Department) to take over.The state mechanism boastfully goes about managing the people’s water system, painting the walls of villages white on blue with slogans of how to save water, yet the kuhls in such places are largely in shambles. “ They must have had excess funds, and so they painted the walls.” Says Tilak, a driver on the Himachal highways, as we pass through neighbouring Nurpur district. The IPH approach is not systemic i.e. it separates very clearly groundwater and flowing surface water. For example, for the two decades through funding and indirect management from other bodies such as NABARD and the Agricultural department or even foreign funders such as USAID and Indo-German Projects, a plan was devised to cement the kuhls. Over the last decade, they have involved NREGA workers, a largely female work force in this district, do the cement work. Furthermore, state control has meant that the Department of Energy has rampantly been constructing hydropower dams, without the prior consent of the people. These hydropower dams block the natural course of water flow; moreover as we recently saw in the case of floods in Kerala, if not properly managed, they can spell doom. In current times of climate change, as reported widely in the national media with the Shimla drought, Himachal Pradesh government has proudly declared itself the first state to practice climate-sensitive agriculture. In addition, the government has prepared a budget of 4,751 crores from the Asian Development Bank and launched a program called “Doubling of Farmer’s Income through Water Harvesting by 2022.” Page number 41 of the ADB report on Climate Change Adaptation in Himachal Pradesh, reads that complete state management will not help the water crisis, instead, this responsibility should be shared with communities and the private sector. The report does talk of the community managed kuhl systems but also talks of government sponsored community groups called Water User Associations (WUAs) set up by the state in various districts. As with the Joint Forest Committees of the state, the people have seen time and again how state sponsored or initiated people’s groups rarely end up working for the benefit of the people. Instead what the people need is to decide and manage their village commons themselves. Learning from Himachal Pradesh, if we look back at the history of water system management in the state, we see that the people do not need political party dictated and fund generating projects. In a situation of climate flux,where there could be flash floods or sudden heat waves and glacial melting, the people needs a bottom-up approach to water management. This would assure a systemic understanding of hydrological systems and decentralised water management ( as indicated in the response by KJ Joy of the Society for Promoting Participatory Ecosystem Management to the Mihir Shah Committee report as well). Furthermore, this would allow a collective, active, experiment based approach needed in current times of climate change rather than the stagnancy and rigidity that has taken over government institutions. It is people who live close to the land, understand the climatic shifts that are occurring and the complex water system, who can best manage these systems. And yes, the people do not need to be coerced with money to take care of their resources. Their age-old connection will take care of this. On the other hand promises such as doubling farmers income and guaranteeing MSP should be met, so that the very people, mostly farmers, who really know how to deal with the challenging times coming up, can live with dignity in their own lands. Aditi Pinto is based in Rakkar, Himachal Pradesh and uses writing to give a historical perspective to current environmental crisis. This article learns from and makes reference to writings by J Mark Baker, KJ Joy, Manshi Asher, Kesang Thakur, Lakshmi Swaminathan,Manu Moudgil and Mrinal Chatterjee. This story is being published as part of a GIZ-CMS Fellowship.